You will be given a reference e-book to read which has 220 pages And the test will be based on that e-book , you can take final test within 1 year of purchase. 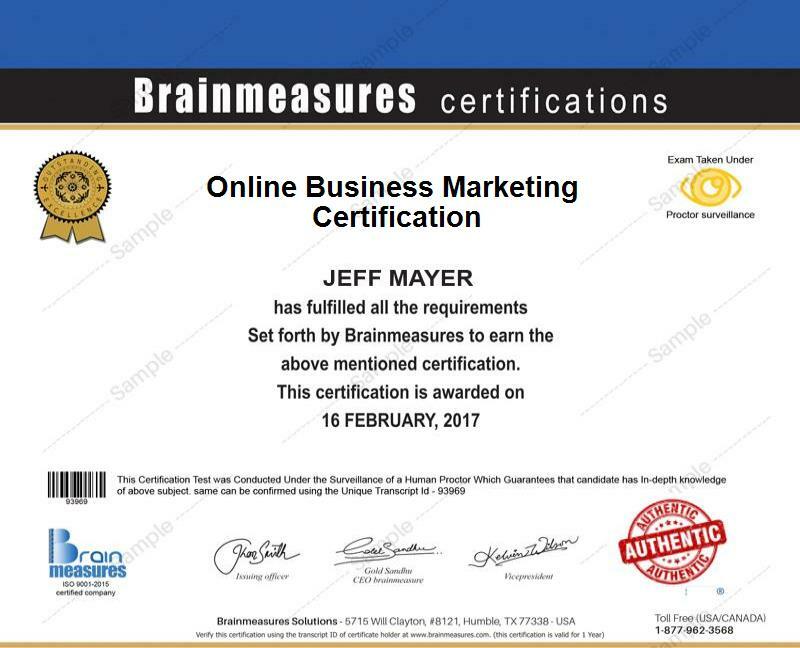 If you want to become an effective and a certified professional when it comes to implementing highly efficient online business marketing strategy and online marketing campaigns, then it is advisable for you to take part in the online business marketing strategy certification program offered by Brainmeasures. This online business marketing strategy course offered by Brainmeasures makes it a point to provide you with a kind of online business marketing strategy training which encompasses all the aspects related to marketing your business, your products and your services online. With the help of this certification course, you will become more familiar about all the strategies that you can use in online marketing and the many things that you can do to make sure that all your online marketing campaigns continue to yield successful and desirable results. As soon as you receive your online business marketing strategy certificate, you can expect your skills and expertise to be in great demand since many business organizations are now in need of professionals who know exactly how to use the internet to market their business and promote their products. How online searching can significantly and positively change the performance of your business? How to effectively build highly reputable searching personas? Hundreds of professionals will be benefited by enrolling in the online business marketing strategy certification program which is now available at Brainmeasures. This certification course can offer a lot of help to small and medium sized business owners and managers, not-for-profit organizations managers or any other manager in an organization who is greatly interested in strengthening and improving their business presence online. This is also beneficial for professionals who wish to improve their strategic marketing skills and marketers who are serious about enhancing their skills in implementing online marketing campaigns. Completing an online business marketing strategy certification course is also a huge help when it comes to raising your salary. You can use your online business marketing strategy certification to work as an online marketing strategy consultant which will let you earn around $36,000 to $73,000 per year. Working as an online marketing manager also lets you receive a salary within the range of $57,000 to $115,000 annually. If you work as an online business marketing director, then you can expect to enjoy an annual salary of around $97,000 to $166,000.